Abstract: Paleocene to Oligocene tectonic processes in northwest Iran resulted in extensive I-type calc-alkaline and alkaline magmatic activity in the Ahar region. 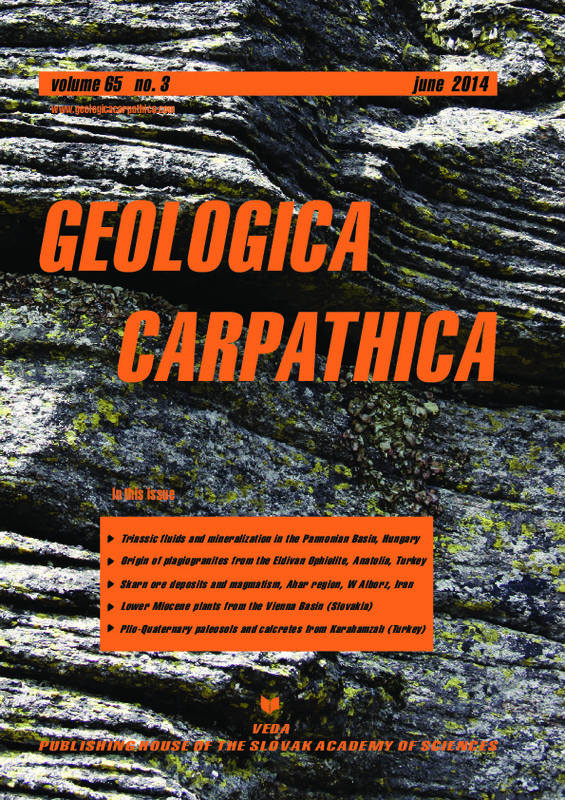 Numerous skarn deposits formed in the contact between Upper Creta- ceous impure carbonate rocks and Oligocene—Miocene plutonic rocks. This study presents new field observations of skarns in the western Alborz range and is based on geochemistry of igneous rocks, mineralogy of the important skarn deposits, and electron microprobe analyses of skarn minerals. These data are used to interpret the metasomatism during sequential skarn formation and the geotectonic setting of the skarn ore deposit related igneous rocks. The skarns were classified into exoskarn, endoskarn and ore skarn. Andraditic garnet is the main skarn mineral; the pyroxene belongs to the diopside-hedenbergite series. The skarnification started with pluton emplacement and metamorphism of carbonate rocks followed by prograde metasomatism and the formation of anhydrous minerals like garnet and pyroxene. The next stage resulted in retro gradation of anhydrous minerals along with the formation of oxide minerals (magnetite and hematite) followed by the formation of hydrosilicate minerals like epidote, actinolite, chlorite, quartz, sericite and sulfide mineralization. In addition to Fe, Si and Mg, substantial amounts of Cu, along with volatile components such as H2S and CO2 were added to the skarn system. Skarn mineralogy and geochemistry of the igneous rocks indicate an island arc or subduction-related origin of the Fe-Cu skarn deposit.